There are two aspects to the MacGuffin that strike me as a reason to use one in story. 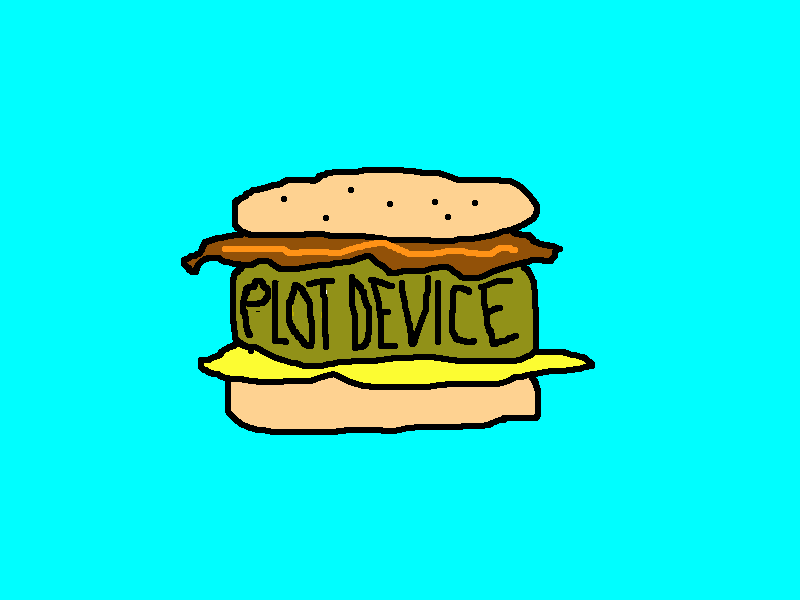 One is that it’s a concrete object, so that makes plotting so much easier. Why a character wants the MacGuffin depends on that character’s personality, but the fact that the character wants something he can pick up and run with makes telling his story so much easier than telling the story of a character who wants inner peace. Good luck with that. The second aspect is that everybody’s chasing it, which takes care of your antagonist problem. What does your protagonist want? The MacGuffin. What does your antagonist want? The MacGuffin. What’s the source of their conflict? They both want the MacGuffin. That’s a nice, tight, simple, concrete struggle that you can hang any number of subplots, metaphors, echoes, and doodads on and still not confuse your reader. Any time she wants to know where she is in the plot, she just has to check to see where the MacGuffin is and she’s good. I’ve been thinking about this because I’m considering a MacGuffin plot for a story called “Cold Hearts.” (I workshopped the first scene on here a while back. It’s changed since then.) The plot was about thieves and conmen and a pink diamond which remained locked in a vault, but as I look at it again, it strikes me that getting it out of the vault and embedding it in a Faberge egg (Egg MacGuffin!) and having people toss it about like a hot potato might be much more fun. 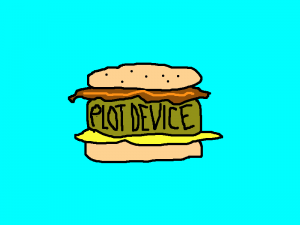 It’s not the kind of plot I usually do, so that would be good, too. But there are pitfalls, too. If the only reason everybody’s chasing this egg is because it’s worth millions, that’s kind of bland. 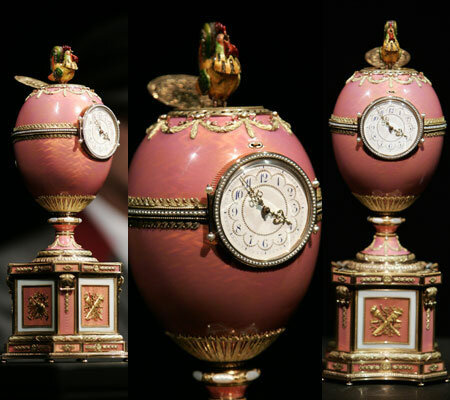 They have to be chasing THIS egg to make it an Egg MacGuffin, it has to be THIS Faberge egg and no other. 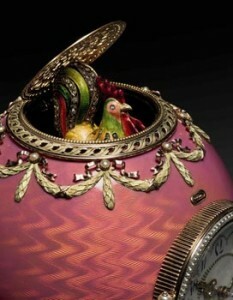 There were no Faberge eggs made with pink diamonds so maybe it’s not a Faberge egg. Maybe it’s a DaVinci egg, although where DaVinci would have gotten a pink diamond is beyond me. Most of the really old, large pink diamonds came from India and ended up in Russia or England. Russia, the Revolution, Rasputin. Faberge was Russian. Hmmm. I don’t want anything supernatural in this one, but there could be something hidden in the egg. This Faberge Egg Clock has a diamond-studded rooster that comes out of the top four times a day. That could be a secret compartment that holds . . . hell, what could be worth more than the egg? It sold at auction several years ago for almost ten million pounds. So I’m cogitating. Doesn’t have to be Faberge. Doesn’t have to be an egg. Does have to be something that’ll fit in a bank vault and that somebody could pick up and run with. Hmmm. If you were writing a story, what kind of MacGuffin would you write? And more important, why?